First off, I'd like to thank Sciabica's Olive Oil Company for their generosity, providing all of us at 37 Cooks with two bottles each of their incredible oils to cook with. I picked their Fall Mission Variety Spring Harvest and their Jalapeno Olive Oils. Both were some of the best olive oils I've ever had. I understand that in making the jalapeno oil, they actually press the jalapeno peppers in with the olives, which I found pretty impressive. We, as the 37 Cooks, agreed to make two different recipes each, and to submit them for posting on our blog. Mix all of the marinade ingredients together, rub all over the lamb and let marinate all day. I put mine in a large Ziploc bag, and kept turning it over every hour. The food police say never to leave meat out of refrigeration, but I left the lamb out for about 4 hours. You do whatever you're comfortable with. You can also use some nice lamb shoulder chops, or lamb loin chops, or even a butterflied leg of lamb. Whatever's available, I say! When you're ready to cook, scrape most of the marinade off the lamb, and save it in a small bowl. Microwave it, or cook it it in a small saucepan, until almost boiling, cause you're gonna use the leftover marinade later for the Brussels sprouts! Start your grill. I use a charcoal grill, and make it a 2 zone fire. One side hot, and one side medium low, 'cause ya wanna be able to get a nice sear on the lamb, then finish cooking to temp on the cooler part of the grill. Throw the lamb on the hot side of the grill, meat side down. Be careful, coz ya have a lotta oil still on the lamb and ya gonna have a flare up, so wipe the lamb off before grilling it. When the meat side is nice and brown, flip it, and brown the other side. Then move it to the cooler side of the grill, and go get the meat thermometer. I cooked two lamb racks. I like mine on the rare side, but my wife likes hers almost well done. 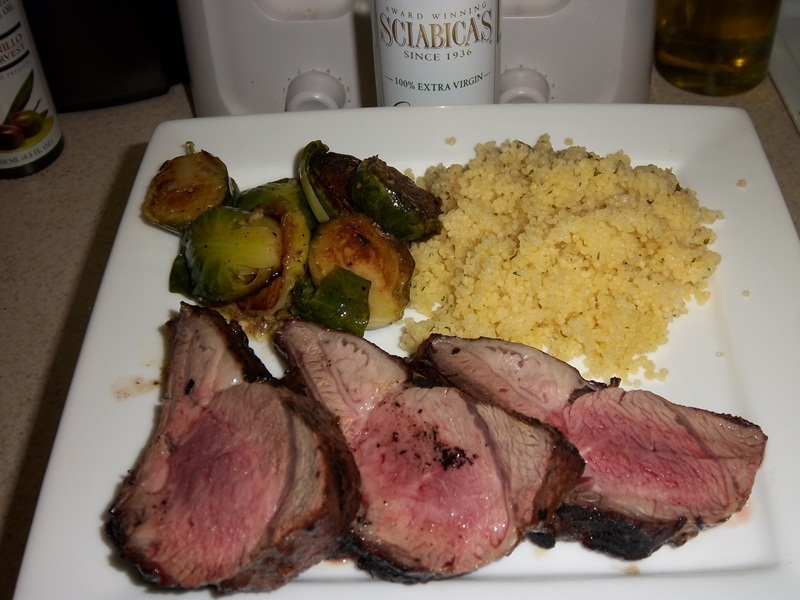 I cooked mine to 120°F, and hers to 155°F, took 'em off the grill and rested them until the sprouts and couscous were done. Heat a large frying pan on medium high heat. Pour about 3 Tablespoons of the oil from the leftover marinade into the pan, until you can see the oil shimmering in the pan. Carefully and quickly lay Brussels sprouts in the pan, cut side down, and toss in the garlic from the marinade. Cover the pan, shaking it every few minutes until you can see the edges of the sprouts starting to brown. Take the pan off the heat, and crack the lid. Now go make your couscous. I use a box of roasted garlic couscous and just go by the directions on the box. I have the water for the couscous simmering before I put the lamb on the grill, as the sprouts and the couscous only take a few minutes to cook. Slice the lamb in between the rib bones to make tiny chops. Layer 'em on a plate with the couscous and the sprouts, and you're good to go. Note: The Sciabica's Jalapeno Extra Virgin Olive Oil gave the sprouts a really pleasant burst of heat. Nothing that's gonna burn your lips off at all, and a lovely jalapeno flavor! I bet this recipe would work very well with their Lemon Extra Virgin Olive Oil, too. That looks great Matt. I will have to give that a try. I love lamb. Arrogant Chef! Thanks for noticing and if you make them, let us know!